Tanya Muise, your Resource Centre Coordinator here, sharing my great love of Christmas with you! I love Christmas. I mean I really, really love Christmas. I love the savoury aroma of a roasting turkey, packed full with two types of stuffing. I love the sight of the blinking Christmas lights as their reflections dance across the freshly fallen snow. I love the sound of children’s giggles as they read their wish list out loud, stumbling over new words. I love the taste of my Mother’s gingerbread cookies fresh from the freezer (yes, the freezer; you really must try it). I love the feeling of wrapping paper and ribbon as I wrap the gifts that took me days to decide on. Halfway through November, I have lost count of the Hallmark Christmas movies I have watched and my car radio is firmly planted on the Sirius Holly XM Station. I have slowly started to place Christmas items around the house and in 7 to 10 days, my husband will suddenly realize that, much to his dismay, our house is starting to look like a Winter Wonderland. He strongly believes that the tree should go up on Christmas Eve and come back down on Boxing Day. This is the same man who loved me enough to agree to have a themed wedding right here at Westheights Church twenty-three Christmases ago. Most of all, I love being with family at Christmas and celebrating the birth of our Saviour. Like the shepherds and wisemen, we gather together to rejoice in His name. It all begins at the Christmas Eve service here in our church. My heart is filled to the brim when I look down the Warkus family row and see my parents, my sister and her family, along with my husband and our sons. One year we were even blessed to have my in-laws from Nova Scotia attend with us. We are surrounded by members of our church family as we raise our voices along with the beautiful music of the worship team. The lighting of the candles is a highlight of the night. It is a Christmas tradition enjoyed by all of our family. 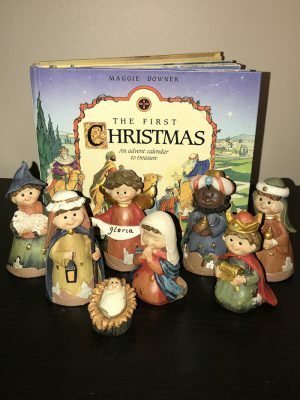 Many years ago, my father gave me a book about the first Christmas. It is a book that I used to read to my little boys each Christmas Eve. Even though they are grown up now, it still comes out every Christmas as I read it to myself. A few years from now, I will read it to the next generation of our family. It is the most meaningful story of all the Christmas books I read each year… and there are a lot of books. One of my favourite things to receive each year as a child was the gift from Book Worm. As much as I appreciated my other gifts, it was the one from the Book Worm that I waited for in anticipation. I couldn’t wait to find myself sliding across the frozen surface of Silver Lake with Laura and Mary or to step through a wardrobe and met a Lion. 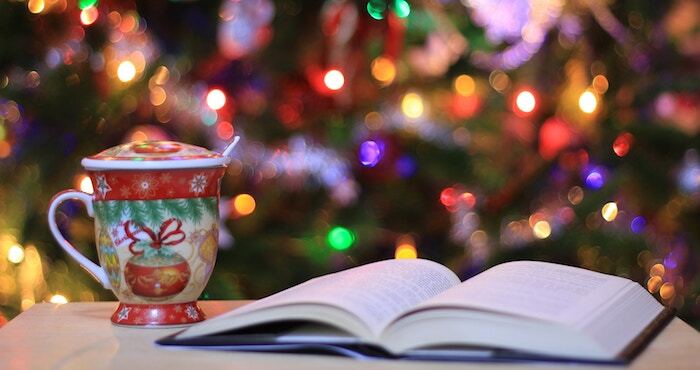 My love of books, especially Christmas books, has continued into adulthood. At the Resource Centre, we have a great collection of Christmas themed books and DVDs. Here is just a selection of what we have for you to borrow and enjoy. CD: INCREDIBLE SINGING CHRISTMAS TREE by The Veggie Tales–A favourite Christmas album that was on repeat in our car when our two boys were toddlers. My husband would listen to it even when they weren’t in the car. Who can resist Joy to the World sung by the most talented vegetables in the world? BOOK: GOD GAVE US CHRISTMAS–When Little Cub asks, “Is God more important than Santa?”, her Mother takes her on a polar expedition to find God and to see how he gave them Christmas. Along the way, they find signs that God is at work all around them. BOOK: SAMMY’S TREE-MENDOUS CHRISTMAS ADVENTURE–Join Sammy and the shepherd as they look for the perfect tree, make cookies, go shopping, and sing carols. Search for them as they journey back to the first Christmas – on the way to Bethlehem, at the Inn, at the birth of Jesus and with the Three Wise Men. BOOK: A FRUITCAKE CHRISTMAS–When Grannypillar’s scrumptious fruitcake disappears, everyone suspects Iggy and Ziggy Cockroach. It takes the young Ladybug twins to show Hermie and his friends that Christmas is not about fruitcake, but about God’s gift to all of us through his son Jesus. BOOK: THE CHRISTMAS LIZARD–When Charlie forgets to close Oscar’s cage door tightly on Christmas Eve, the pet iguana goes on a midnight adventure and climbs the flickering, shimmering tree in the living room. There he meets a nutcracker, elves and a keepsake who tell him versions of what Christmas is all about. DVD: MANDIE AND THE FORGOTTEN CHRISTMAS–While visiting the school’s forbidden attic, Mandie stumbles upon a mystery from which she is warned to flee. Seeking the truth will require Mandie to lie but it just might provide the key that unlocks the memories of a long forgotten Christmas. DVD: MERRY LARRY & THE TRUE LIGHT OF CHRISTMAS–Our favourite Veggies, Bob and Larry, are going all out to make it the best Christmas ever at the Spring Valley Mall. A little girl with a big heart changes everything when she shows them all what Christmas is really about. DVD: THE LAST STRAW–Silent nights…and days are nowhere to be found at the Macdonald house until Mom remembers and old tradition of building a soft bed for Jesus one straw at a time. Every time someone does something nice for another family member, they get to add a single straw to the manger. DVD: LOVE’S CHRISTMAS JOURNEY–If Ellie can trust her faith, this Christmas might bring more miracles than she could have hoped for in an exhilarating story inspired by Janette Oke’s cherished Love Comes Softly novel series. BOOK: CATCHING CHRISTMAS by Terri Blackstock–Miss Callie leads Cab Driver Finn Parrish on a wild goose chase to find a Christmas date for her Granddaughter. When Finn meets Sydney, he’s sure she doesn’t need help to find a date but will do whatever it takes to fill Miss Callie’s Christmas wish. BOOK: A ROYAL CHRISTMAS WEDDING by Rachel Hauck–When Prince Colin of Brighton Kingdom finds himself at the center of a centuries old tradition, he must decide whether to follow the path laid out before him or follow his heart to the only woman for whom he would ring the Pembroke Chapel Bell. BOOK: THE CHRISTMAS HEIRLOOM–Four Holiday Novellas. An heirloom brooch is passed from mother to daughter for almost two hundred years in these stories ranging from 1820’s Regency England to present day Washington State. BOOK: A BAXTER FAMILY CHRISTMAS by Karen Kingsbury–As Christmas nears, John Baxter makes a bold gesture – he invites a stranger to share Christmas Eve dinner with his family. But not just any stranger, the woman is the recipient of his daughter’s heart. What impact will this have on each family member? BOOK: AN AMISH CHRISTMAS–Four Christmas Novellas. Amish fiction is a must-have in any church Resource Centre. Enjoy four stories based in December in Lancaster County by four popular authors. Includes authentic Old Order Amish recipes.